How does it work? The entire AcuGraph exam takes less than two minutes. 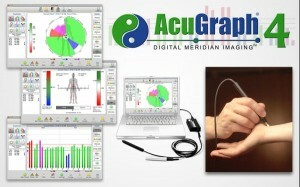 MEASURE each meridian with AcuGraph’s computerized measurement probe, as the computer guides you, point-by-point with clear photographic illustrations and verbal prompts. WATCH in amazement as AcuGraph instantly provides complete graphical analysis and interpretation of the patient’s meridian energetics in 9 different graph styles in a format patients readily embrace. The Personal Integrated Energetics (P.I.E.) score boils the results down to a single number patients readily understand. TREAT the most effective acupuncture points for the patient, based on AcuGraph’s intelligent analysis and 9 available guided treatment protocols. Supplement your treatment with custom recommendations of your own, all automatically determined and recommended by the software. COMPARE the incredible results experienced by your patients and tracked by subsequent AcuGraph examinations. Only AcuGraph gives you Evidence-Based Acupuncture™ documentation and tracking for superior documentation and patient compliance.